Neptune is the eighth planet from the Sun that was first telescopically discovered by the German astronomer Johann Gottfried Galle (1812-1910) on 23rd September 1846, and discovered 65 years 6 months 10 days after William Herschel had found Uranus. In the outer regions of the Solar System, this remote planet lies far from the glowing warmth of the Sun. Neptune’s place as the furthest planet was held until on 18th February 1930, when American Clyde Tombaugh (1905-1997) discovered the even further and remote, Pluto. This demotion of the most distant planet was only to last until 2006, some seventy-six years later, when the International Astronomical Union (I.A.U.) decided Pluto planetary status was to be withdrawn. So Neptune has again become the holder of the most distant planet in our Solar System. Neptune is presently (2015) within the constellation of Aquarius, where it will stay until the planet moves in nearby Cetus for short time sometime during 2023 to 2030. The side table (Table 1) shows what zodiac constellations Neptune can be found until 2160 AD. For southern observers, the planet will continue for over a century to become more unfavourably placed as it slowly crawls into the northern portion of the zodiac. This trend will not be reversed until about 2095 AD, and will be best placed again 2130 AD. Best location for southern observers was last in Sagittarius in 1930 AD. Although often stated as bluish, blue-green, or even blue-greenish in colour, Neptune to amateur eyes is certainly much deeper blue than the more greenish coloured Uranus. Colour differences are attributed to gaseous methane in the upper atmosphere. 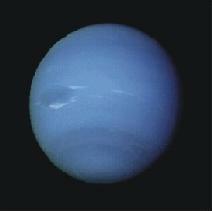 Neptunian images taken by Voyager 2 or the Hubble Space Telescope (HST), are more azure blue. These pictures, of course, are greatly enhanced, but in truth, the amount of sunlight available is very much reduced making the colouration slightly greyer. At its mean distance, Neptune sees the Sun shining at -19.4, being about 700 times fainter than from Earth or 570 times brighter than the full moon. The eighth, and now last of the recognised planets, Neptune is not overly difficult to find in the sky, but requires optical aid, as it always remains below naked-eye visibility. All that is required is knowledge of the general sky positions and having some dedicated star map or standard star atlas to find it. It is easily spotted in darkened skies, either 7×50 binoculars or small telescopes. In small apertures, it appears like an ordinary ‘star’, and will be only be discerned as a tiny disk in 10cm or 15cm telescopes. At opposition, Neptune reaches maximum visual magnitude around 7.8v, but drops only a few tenths to 8.0v or 8.1v near conjunction. These small brightness differences, unlike the other planets, excepting Uranus, are due to the 300 million kilometre (2 AU.) distance of Earth orbit compared to the planetary mean distance of about 30 AU. Unlike the other seven known planets, discovery was not by chance or luck, but through the application of celestial mechanics and mathematics. As earlier stated in the introduction, Neptune was first visually discovered almost immediately by the German astronomer Johann Gottfried Galle (1812-1910) on 23rd September 1846. Galle’s discovery was to be delivered directly to him in some correspondence with French mathematician Urbain Jean Joseph Le Verrier (1811-1877) (or Leverrier) on 18th September, 1846, when he was kindly requested to inspect a region of sky in the constellation of Aquarius. After finding an unlisted and unmapped star, Galle again observed the same object over two nights, whose small movement had told him straight away this was the predicted distant planet. Neptune had also been suspected to be significantly influencing the calculated orbits of Saturn, and in particular, Uranus. These initial concerns of Neptune position were of the apparent slow orbital displacements, known as perturbations from what was predicted by the planet Uranus. By the 1820s, Uranus’ own position had been out by an ‘intolerable quantity’ totally an extraordinary 1 to 2 arc minutes. Astronomers knew that the only possible solution was that Uranus was being affected by another unknown planet further out in the Solar System depths. During 1846, after many decades of speculation, its planetary position was firmly predicted independently by both Englishman John Couch Adams (1819-1891) and French mathematician Le Verrier. Both had calculated the place of the new planet on the ecliptic, and being within ten degrees (10°) for Adams, and within one degree (1°) by Le Verrier. This became the first example of some Solar System object to have been predicted before it was actual discovered. This brilliant achievement was made by careful computations of the gravitational or perturbing effects by Saturn and Uranus. In the mid-19th Century John Adams and Urbain Le Verrier results were considered marvellous examples of deductive and theoretical mathematical astronomy — being held as the significant scientific milestone at the dawn of the the astronomical science known as astrophysics.